If someone you know has cancer and they’re curious about alternative medicine, discover how Traditional Chinese Medicine and Chinese Reflexology can support the body’s natural healing process. This isn’t an all or nothing approach. It’s about balance. Take the best from the West, and combine it with wisdom from the East to restore your health and vitality. Louise Hay, the author of You Can Heal Your Life, was a pioneer in raising awareness about the mind body connection. In her bestselling book and in an interview in the New York Times, she credited a regimen of nutrition, forgiveness, and reflexology with helping her recover her health when she was diagnosed with cervical cancer. She was diagnosed in the late 1970s, and not only did she fully recover, she went on to lead an incredible life. She founded the publishing juggernaut, Hay House, which reaches millions of people worldwide. Louse passed away recently on her 90th birthday. After sharing how Louise considered reflexology integral to her recovery, I want to caveat this article by saying that I am NOT claiming nor am I suggesting that reflexology can cure cancer. I wrote more about this in Part One of my articles on cancer. If you haven’t read it yet, I’d highly recommend reading the preceding articles because they create a foundation for getting more out of this article. Part One of this article series was on “Restoring Balance with Traditional Chinese Medicine (TCM) and Chinese Reflexology.” Part Two was about the emotional roots of disease and disharmony. So now you may be getting an inkling that this isn’t your standard “eat this, do that” advice. I see my role as providing a different perspective—not one to throw the baby out with the bath water—but one that expands your perspective so that you have more tools to help with healing, and that you’re more in tune with your body so that you can feel which tools are the right ones for you. There is no magic six-point reflexology formula that will miraculously cure someone of cancer. Someone who is diagnosed with cancer should continue to see their medical professional and follow their recommendations. The points in this article are a good starting point to help recharge the body’s energy levels, improve the flow of qi (life force energy), and boost the body’s ability to flush out toxins. As a result, the body has more energy to focus on healing. Follow the instructions in this article. Do not massage for more than the recommended times or use any tools other than what is described in this article. A person with cancer has a compromised immune system and a lot of toxins in their body. A gentle approach needs to be taken to avoid overwhelming the body. 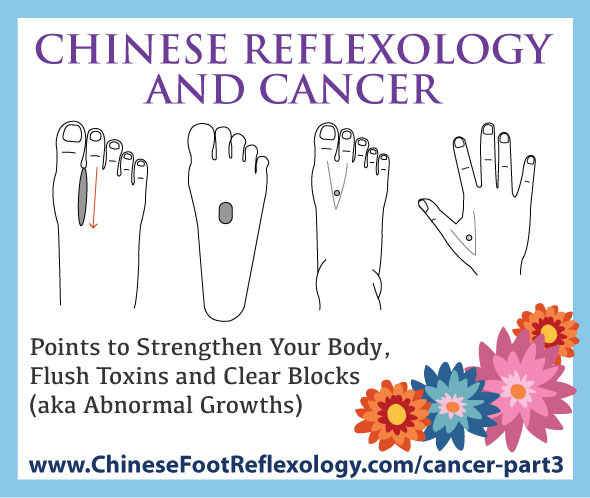 Do not choose your own Chinese Reflexology points for cancer. The points in this article were selected because when they are massaged as directed, they are beneficial for everyone. Other reflexology points have different purposes and can be detrimental to someone with a weak or overloaded system, such as someone diagnosed with cancer. As mentioned above, a gentle approach needs to be taken to avoid overwhelming the body. More is NOT more. Massaging more points, more pressure, or more time will not lead to faster healing, and can actually be COUTERPRODUCTIVE TO HEALING. In order to restore balance in your body, you need to take a balanced approach to healing. Will these points cure cancer? Nope, but they can certainly support the body in dealing with two of the key imbalances that make a person more likely to have an abnormal growth in their body. From a Chinese Medicine, the build up of toxins and stagnant or blocked qi (life force energy) can lead to abnormal growths. For more about the underlying roots, please read Part One in this article series. To get the most benefit from Chinese Reflexology, someone with an abnormal growth should have all of their Chinese Reflexology points massaged regularly by a professional who is trained in Traditional Chinese Medicine and Chinese Reflexology. It’s important to identify the underlying disharmonies that are creating the imbalances in the body, and this is best done in person. Chinese Medicine is not a one-size-fits-all solution. It needs to be custom tailored and adjusted for the individual—especially over the course of their treatment. That said, whatever you can do to reduce the toxic load in your body and help it flush out toxins is helpful for restoring balance. Instead of dealing with the toxins, your body can then focus more of its energy on healing. The points in this article have been carefully chosen to boost the body’s energy stores, and improve the circulation of qi to help flush out toxins. The times recommended are for massaging with the fingers and knuckles as directed. Remember more is not more, and a balanced approach is needed to restore balance in the body. The Kidneys are one of the most important organs in Traditional Chinese Medicine because they’re considered “the root of life.” They’re like batteries that store your qi or life force energy. If Kidney qi is weak, the body’s overall energy levels will be weak and this results in fewer reserves for fighting disease. From a Western medicine perspective, the kidneys play an important role in helping to clear toxins out of the body. The kidneys filter waste from the blood, and then produce urine to excrete the waste from the body. WARNING: Do not massage the Kidney point if you are pregnant because it is located near the acupuncture point, Kidney-1, which is used for inducing labor. 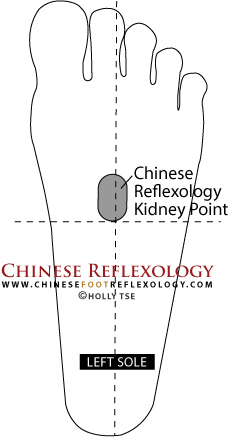 The Kidney reflexology point is located on the sole of the foot. You’ll find a Kidney point on both the left foot and right foot. To locate this point, imagine a horizontal line dividing your foot in half from the tip of your big toe to the base of your heel. Then imagine a vertical line dividing your foot in half. These two lines form four quadrants. The Kidney point is an oval-shaped area that is located in the top two quadrants. Two thirds of the point is in the top inside quadrant and one third is in the top outside quadrant. To massage the Kidney point, press into it with your thumb, and massage up and down for 30 seconds. For more detailed instructions on how to locate this point, sign up for my free mini course on Chinese Reflexology. The Kidney point is Lesson 3 in this series of free lessons. You’ll also get a free downloadable Chinese Reflexology foot chart when you sign up for the free mini course. The Chinese Reflexology point for lymphatic drainage reflexology point supports the lymphatic system. This system supports the immune system, and helps filter out toxins and cellular waste products. The reflexology point for lymphatic drainage is super easy to find. It’s located on the tops of the feet in the webbing between the big toe and second toe. To massage this point, use your index finger knuckle to press and stroke down in one direction only: from the base of your toes towards the bottom of the V that’s formed where the two bones meet. When you reach the bottom of the V, lift up your knuckle, start again at the base of your toes, and stroke away from the toes. Repeat for 30 strokes. Be mindful to not press too hard, and do not massage for more than 30 strokes because the skin on the top of the foot is more sensitive than the sole. If you feel friction while massaging this point, apply a lubricant such as massage oil or a greasy moisturizer to eliminate the friction. While the reflexology point for lymphatic drainage helps with circulation of lymph through the lymphatic system, the next two acupressure points improve the circulation of qi and blood throughout the body. 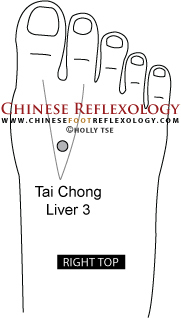 The first one is referred to as Liver-3 or Tai Chong. WARNING: Do not massage this point if you are pregnant because it is used to induce labor. This acupressure point is located on the top of the foot in the webbing between the big toe and the second toe. Lightly feel for the bones of these two toes to identify where they intersect and form a “V”. Tai Chong is just above the point of the “V”. To stimulate this point, simply press into the depression in the webbing above the “V”, and hold for 30 seconds. Repeat on the other foot. 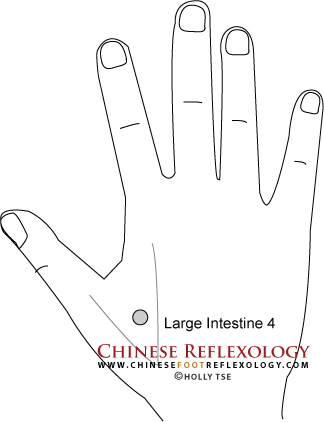 He Gu or Large Intestine 4 is located on your hand. Combined with Tai Chong, these points are known as the Four Gates. In Chinese Medicine, these points are an extremely powerful combination to improve the flow of qi and blood. He Gu’s location is similar to Tai Chong, only it’s on the webbing of your hand between the thumb and index finger. To locate this point, press your thumb and index finger together to cause the muscle at the base of the thumb to bulge out. Place your opposite thumb on the highest point of this bulge. Then relax your thumb and index finger as you open your hand. The opposite thumb should be resting in the webbing on the spot where He Gu is located. To activate this point, simply press and hold with your opposite thumb for 30 seconds. Repeat with the other hand. While there is no simple “five-point 14-day plan” to cure cancer, lose weight, or make six-figures, these three articles will expand your perspective, and get you started on a new path. Your health is the sum of everything that has come before, so the good news is that you can start changing your future today!